The Laurentide Ice Sheet grew during the Wisconsin stage. It stopped north of the Ohio River and the Pennsylvania Turnpike, and at modern New York City. During the furthest extent of the ice that ended 18,000 years ago, Virginia was never buried underneath a thick layer of ice. Virginia still experienced significant impacts from the cold climate in the last Ice Age. 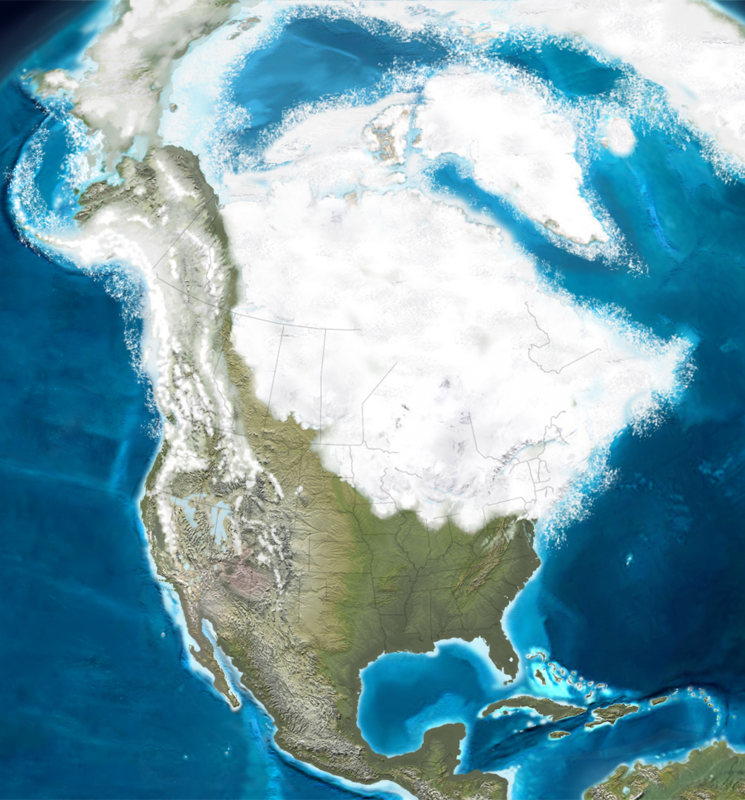 The Laurentide Ice Sheet altered the location of the Atlantic Ocean shoreline. At the start of the last glacial period 125,000 years ago, sea level was about 15' higher than today. Sea level dropped 400' as water was trapped in the ice sheet. The Continental Shelf was exposed, and the shoreline was as much as 75 miles east of modern Virginia Beach. The weight on the ice sheet pressed down on the bedrock, depressing the land into southern Pennsylvania. The land further south flexed in response to the pressure and bent upwards. As a result, at the peak of the Ice Age the land along Virginia's coastline was raised up. Sea level was already as much as 400 meters lower because so much water was trapped in the glaciers, and the eastern coastline of Virginia was as much as 40 miles east of the current location. The flexing earth raised the Virginia coastline even higher and extended the Coastal Plain even further to the east. 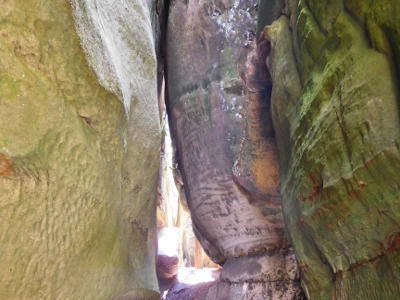 In the Valley and Ridge province, blocks of stone cracked loose from the bedrock on the sandstone ridges, slid downhill, and created piles of boulders in a talus slope below the quartzite bedrock. When the climate warmed, the hillsides stabilized and the forests returned. 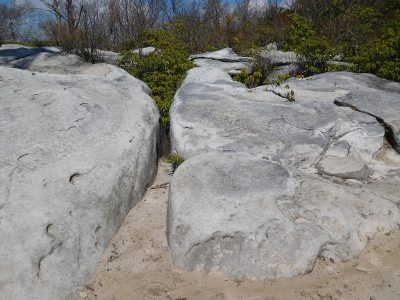 Trees grew below the talus pile and above their eroding bedrock source, but not on the barren boulders themselves. Glaciers did not carve the landscape in southwestern Virginia, but the Ice Age climate (as well as earthquakes) may have been a factor in creating the largest known landslides in eastern North America. For 20 miles, land has slumped along the eastern slope of Sinking Creek Mountain west of modern-day Blacksburg. How Will the Environment of Virginia Change? 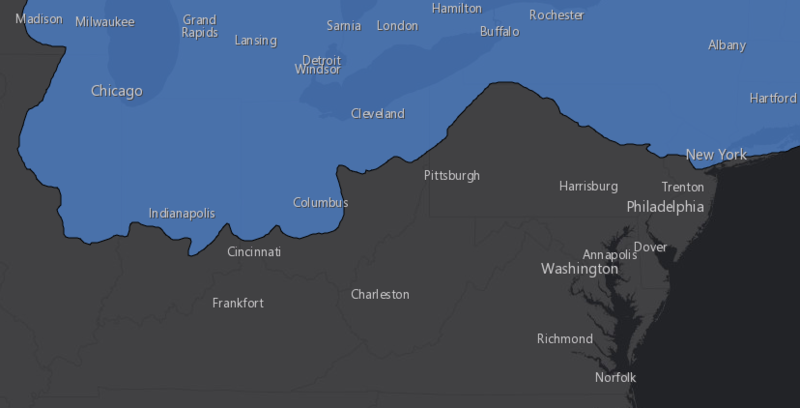 How much of West Virginia was covered by glaciers during the "Ice Age?"